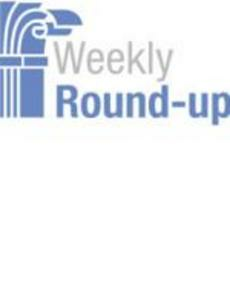 The IBM Center's Weekly Round Up highlights articles and insights that we found interesting for the week ending July 10. Deconstructing Chief Data Officers. Federal News Radio is running a series of articles around the new role of agency chief data officers – who they are, what they do, and where do they fit with agency Chief Information and Chief Technology Officers? Part 1: Finding a balance in the pantheon of “chiefs” Part 2: An interview with DJ Patil, the White House’s first “chief data scientist.” More installments to come! 18F Pushes Plain Language. Federal Times reports: “As part of its mission to make government websites more effective and accessible, the team at 18F published a content guide to help agencies write clearly, concisely and tailored for the web.” A Growing Network of “Networks of Innovators.” In a blog post on the UK government’s website, GovLab’sBeth Noveck and Andrew Young discuss not only UK efforts to create networks of innovators but also that: “The 'Network of Innovators' launched at the Canada International Open Data Conference to explore how we could answer the need to connect creativity and knowledge.” An Inventory of Strategic Foresight. A new website sponsored by The Dialogue and the Inter-American Development Bank catalogs nearly 800 studies tracking global trends and future scenarios. HHS Pushes “Passion Projects.” NextGov reports that the new chief technology officer at the Department of Health and Human Services, Susannah Fox, “wants to infuse the roughly 90,000-person agency with some Silicon Valley-style entrepreneurial spirit.” She proposes “creativity zones” in each division, innovation awards, and the use of open source standards for IT development. How Bad News Is Good News. HuffingtonPost’s James Anderson writes an op-ed about what was learned from the nation’s first social impact bond. The project was to reduce recidivism among teens released from Rikers Island prison in New York City. Fund guarantees of $7.2 million were provided by both Goldman Sachs and Bloomberg Philanthropies; they would be reimbursed by the government only if the project succeeded. Since the project failed, the government did not have to pay. The Urban Institute writes: “The social impact bond transaction worked exactly as intended.” Knowing something doesn’t work allows better decisions and better use of public monies. Can the Defense Department Rekindle Romance With Silicon Valley? Defense Secretary Ash Carter is in Sun Valley, Idaho Thursday to address a so-called “billionaire's summer camp" hosted each year by Allen & Co. Carter’s remarks -- which are closed to the press -- will focus on his plan to bring Silicon Valley entrepreneurs into the national security fold, a Pentagon spokesperson says. The move would allow the military to begin playing a bit of catch up with the breakthroughs in communications and information technology being pushed by the private sector. Industry Seeing Gains in EHR Usability and Safety, but Challenges Remain. Market consolidation among electronic health record vendors and recent action by the Office of the National Coordinator for Health IT have led to improvements in EHR safety and usability. But many experts say vendors still aren't incorporating user-centered design advances quickly enough. DHS' Johnson: We're close to sharing cyber threat data in real time. The Homeland Security Department is rushing to give civilian agencies tools to share information about cybersecurity threats nearly as they happen. After OPM data breach, what is the state of cybersecurity? Commerce CIO assesses cybersecurity in wake of OPM breaches * * * * * The Business of Government Radio Show: Interview with Ellen Herbst, Chief Financial Officer and Assistant Secretary of Administration, US Department of Commerce. What is the management and performance agenda for the U.S. Department of Commerce? How is Commerce working to transform the way it does business? What is Commerce doing to support its employees and reforming its hiring process? Join host Michael Keegan as he explores these questions and more with Ellen Herbst, Chief Financial Officer and Assistant Secretary of Administration, U.S. Department of Commerce. Broadcast Schedule: The show airs Monday at 11 a.m., and Wednesday at noon, on Federal News Radio 1500AM WFED. If you can't wait, though, you can listen to (or download) this week's program and all our previous interviews at businessofgovernment.org.